If you have considered the convenience of an office or commercial cleaning service then perhaps this article will assist you in making an informed decision. We have found that most of our client’s employees feel much more productive when working in a clean and hygienic office environment. The convenience of having a dedicated cleaner to take care of cleaning tasks gives our clients peace of mind so that they can continue with day to day business without the hassles of cleaning the work space themselves. Businesses that hire an office cleaning service often find that their employees often work harder and are more positive about coming to work when they can see that their employer has taken the time to hire a cleaning company to take care of the cleaning tasks. This shows your employees that you are committed to making their working environment a welcoming one instead of burdening them with extra cleaning tasks. Cleaning companies have the expertise and can supply the correct type of cleaning chemicals and equipment. Should you prefer green cleaning chemicals, a professional cleaning service should be able to provide this and include this in your contract. The chemicals used by weClean are SABS approved and our equipment is also of the best quality. This also saves you time and money because we find the best suppliers instead of shopping for supplies at the local Super Market. We have found that in South Africa pricing is always a problem for most companies. We understand that it is important to keep the costs down. With that said, it is always best to find out exactly what is included in the service provided. The cleaner carrying out the cleaning must get paid what the law provides as a minimum. The law also says that UIF, SDL, WCA and a provident fund needs to be paid. We have found that some companies do cut corners. At the end of the day the person carrying out the cleaning is the one who suffers the most. At weClean we ensure these requirements are met. We also ensure that our staff are treated with respect and dignity and we make sure that they earn an above average wage. If you are considering hiring a cleaning company to take care of your cleaning requirements. 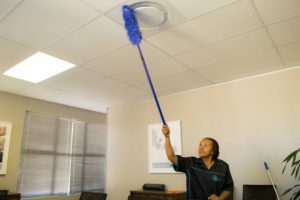 Give us a call 021 802 6450/1 or email us info@weclean.co.za and we will get back to you with the best service possible.